Constructed of durable wood and covered with heavy, easy-care vinyl Expand your storage solutions with this Seward Collegiate Collection Footlocker Trunk with Wheels. Durable wooden construction, a heavy gauge vinyl covering and a paper-lined interior to protect contents make this trunk a reliable solution for all of your storage and organizational needs. 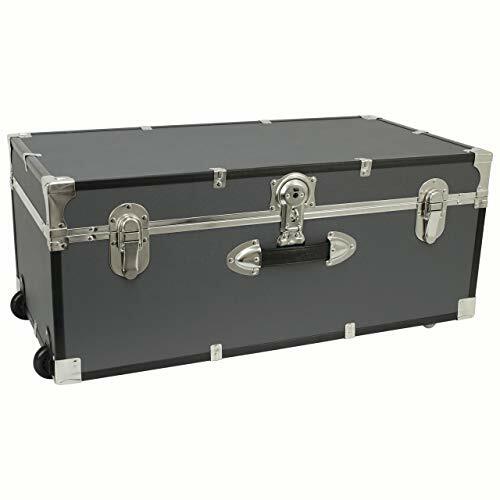 Designed with durability in mind, the Seward Collegiate Collection Footlocker Trunk with Wheels is made with black high impact styrene bindings, nickel plated hardware and two durable recessed wheels. It also features an easy open push button key lock (includes two keys) and can also be locked with a padlock for added security. If you have any questions about this product by Seward Trunk Footlocker, contact us by completing and submitting the form below. If you are looking for a specif part number, please include it with your message.